Today we have guest a reviewer! Sarah O’Connor. You can read her review of Rockaway Taco below. 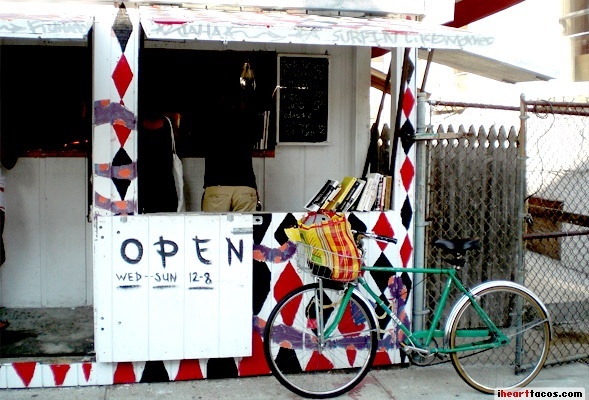 When I heard that a few surfers had opened up a taco shack in the Rockaways I could barely contain my excitement. Last weekend I was able to convince a friend to join me after a day in the sun. So we trekked along the boardwalk to 96th Street to Rockaway Taco. The place is a tiny shack; you place your order at a window in the front and eat outside on the patio. The atmosphere is very authentic Californian – my fellow patrons were stretched out enjoying the last rays of the day and drinking 22 ounce Coronas they bought at a nearby deli.